The Washington Post published an op-ed co-written by our co-CEO Evan Stone, founder of Discipline Revolution Project, Cami Anderson, and CEO of Education Leaders of Color, Layla Avila, about the important role the federal government must play in safeguarding students’ civil rights without stifling state and local decision-making or teachers’ autonomy in their classroom. This op-ed is a response to Secretary Betsy DeVos' unfortunate decision to rescind federal guidance that gave teachers and schools the tools to discipline students without discriminating. This decision reflects a true failure of leadership at the federal level. That's why you must urge state officials to do everything they can to keep students in class, not handcuffs. Will you take two minutes to ask your Governor and state legislators to commit to supporting efforts to reduce discipline disparities? As the education advocates wrote in their op-ed, we must all take responsibility for rethinking discipline. Suspensions and expulsions are linked to students failing classes, not graduating, and too often a lifetime connected to the juvenile and adult justice systems. 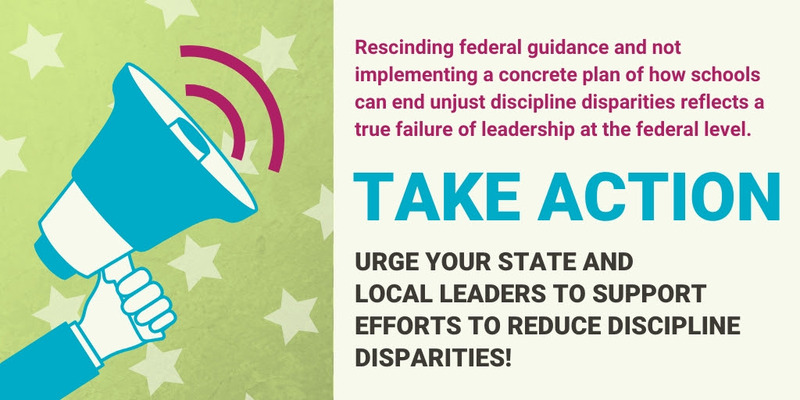 Please take action now and encourage your Governor and state legislators to pick up where the federal government has failed by committing to support efforts to reduce discipline disparities. Can we count on you? Click here to contact your state leaders.